The Pattonville Board of Education on Sept. 25 approved tax rates for the 2018-2019 school year which keep the rate for residential properties unchanged from the previous four years. Maintaining the same rate for five years is in step with the district's promise to voters who approved Proposition P in 2013 to limit the residential tax rate increase to 35 cents for as many years as possible. 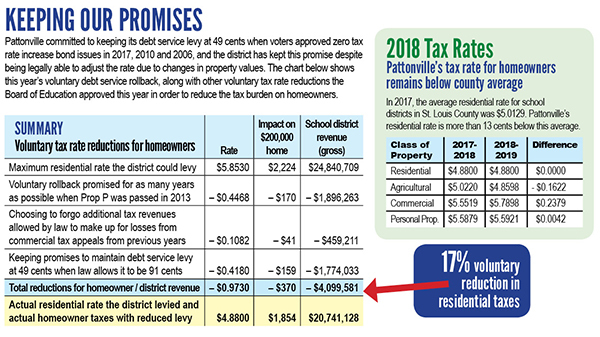 The passage of Proposition P enabled Pattonville to approve balanced budgets for the last five years and prevented the need to cut $10 million in spending after already cutting $8 million between 2007 and 2013. Proposition P was an overall tax rate increase of $0.9972 designed to maintain and protect Pattonville's current instructional programs and staffing levels. Pattonville is voluntarily limiting the increase to 35 cents for homeowners for as many years as possible in order to reduce the burden on residents. The district's debt service levy, which is part of the district's overall tax levy, remains unchanged at 49 cents per $100 of assessed valuation, as promised to voters when they approved zero tax rate increase bond issues in 2017, 2010 and 2006. Under the state's formula for calculating tax rates and the district's taxing capacity, the district could have levied 41 cents more. Over the past year commercial property owners received more than $2 million in property tax refunds due to successful appeals of their property values to the state tax commission. Based on state law, these refunds could have shifted more than $400,000 in additional tax burden to Pattonville’s homeowners and increased the residential tax rate by nearly 11 cents. In an effort to protect district homeowners, Pattonville not to access the additional levy in order to lessen the burden on homeowners. Approximately 86 percent of Pattonville's revenue comes from local sources, which include taxes paid on property in the district. These taxes are based on the assessed value of the property, as determined by the St. Louis County assessor's office. The value of property in Pattonville remained flat in 2017.